This is a wonderful, moist and easy to make upside down peach tart from the Piedmont region of Italy. Crushed amaretti cookies give added flavor to both the batter and the crust. Butter a 9 x 2 inch deep round cake pan. Line with parchment paper and butter the paper. Set aside. In a food processor, grind 8 amaretti cookies until they are crumbs and set aside. Add the remaining cookies to the food processor along with the sugar, almonds and butter. Pulse until the nuts are finely ground. Press the mixture into the bottom of the cake pan. Refrigerate. Combine the 1/2 cup sugar and butter in a bowl and beat well with a hand mixer. Add the eggs, flour sifted with the salt, baking powder and cinnamon, then the milk, zest and extract one at a time, continuing to mix the batter well for 1 minute. Fold in the remaining amaretti cookie crumbs. Arrange the peaches over the almond cookie crust in an overlapping design leaving just a little space between the fruit and the sides of the pan. Pour the batter slowly over the peaches. Bake for 30-35 minutes or until the cake begins to come away from the sides of the pan, is soft to the touch but golden in color. Remove the cake from the oven and allow it to cool for 5 minutes. Unmold it onto a round serving platter. Carefully remove and discard the parchment paper. Cut into wedges to serve. This cake is best served warm with vanilla gelato or whipped cream. This recipe is featured on show 2206 – Exquisite Cakes – Le Torte Squisite. 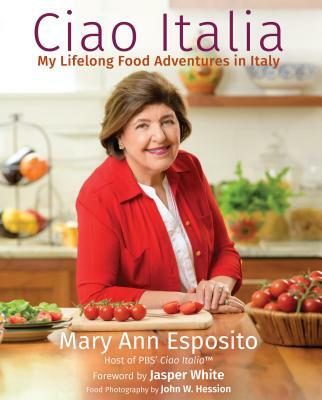 This recipe is from Ciao Italia Family Classics by Mary Ann Esposito. This recipe is featured on Season 22 - Episode 2206.
lists baking powder instead . Please clarify for me as I would definitely like to try it . I'd like to try this as Mary Ann made it look easy to make and super delicious! However, the website recipe calls for baking POWDER, but Mary Ann says twice on her show to add baking SODA, which is it? 2. Also want to know if it's baking soda or powder. Anxious to get baking--this sounds delicious!! Love your program and watch it every time I can. You are easy to understand, nice, funny and very knowledgeable! Another compliment is for your website, which is pretty, accurate and nice to navigate.